Obama's fiscal cliff offer: Conservatives may see it as triple-counting. 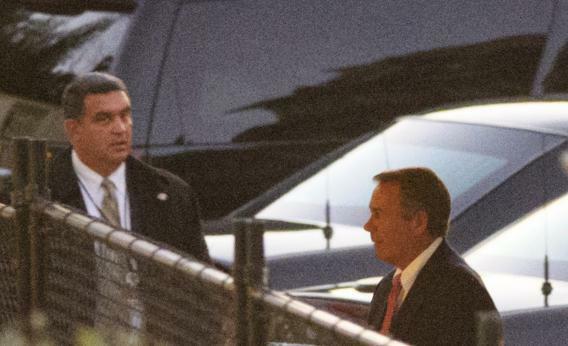 House Speaker John Boehner arrives at the Westwing of the White House for a meeting with US President Barack Obama over the deadlock in the ‘fiscal cliff’ tax and austerity crisis on December 13, 2012 in Washington, DC. I mostly know liberals in this town, but last night I got a chance to hear an intelligent conservative’s skeptical take on the kind of fiscal cliff deal the White House has been pushing for this week and it’s worth sharing. The way this guy saw it, Obama has put about $1.2 trillion of spending cuts on the table but he’s essentially triple-counting them. On the one hand, these cuts are supposed to offset the scheduled budget sequester cuts. On the other hand, these cuts are supposed to create a 1:1 ratio of spending cuts to tax hikes as part of a “balanced” deficit reduction package. And then on the third hand, these cuts constitute the pound of flesh extracted from the administration in exchange for raising the debt ceiling. Within that framework, it looks a lot smarter for conservatives to just give Obama the $800 billion or so in revenue that would occur if the House passes the already-passed Senate bill to extend the middle class tax cuts and simply lets the high-end cuts expire. Then Obama’s raised $400 billion less in revenue than he wants, the GOP perhaps preserves leverage over the debt ceiling, and with the sequester cuts implemented by default Republicans can insist on a 1:1 ratio of new cuts for old cuts if Obama wants to rescind it. That’s a fairly sensible perspective. And it’s a reminder that the underlying premise of Obama’s approach to grand bargaining is the basically untested one that Congressional Republicans are really yearning for a chance to take a bite or two out of Social Security and Medicare. The last time the GOP ran the show, of course, they actually increased Medicare spending so it’s not obvious this is the case. If they mostly just care about minimizing taxes and cutting aggregate spending down to size arbitrarily, it’s not clear that a deal has more appeal than just folding on the high-end tax cuts and fighting another day.